In knitting, before you start any project, you knit a gauge. The gauge is a small square of fabric you knit in the pattern of the project to make sure that you are using the right size yarn and needles so your project comes out the right size. You should never knit anything without first knitting a gauge. For those of us who have tried to skip knitting a gauge, we know that most of those projects never turned out right in the end. In knitting you use a gauge to predict what will become of what you are making. In life I see knitting as a gauge for Mom’s illness. I was able to go knitting again with Mom a few weeks ago and it reminded me of how as her dementia and Parkinson’s has increased, her ability to knit has decreased. 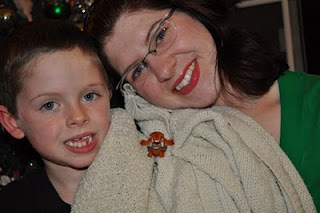 Jeffrey, his Bakugan "Dragonoid", and me with our blankets. Mom made me a blanket in about eighth grade, and I took it to the group to be repaired because it has a hole in it. This blanket and the one she made my son remind me of what Mom used to be able to do and they show how her abilities have changed so much over the years. Just three years ago she was still able to knit a blanket, even if it took much longer than it used to. A year ago she was at least able to slowly knit something small like a scarf. For months now she has not knit a row of fabric. While Mom’s ability to knit has been a gauge of her progression, the knitting group and Mom’s knitted items that we have are a gauge for how we care for one another. The knitters always welcome and help Mom and love her at every stage of her life. The gauge of their love for her is never ending. The blankets my son and I have are everlasting reminders of Mom and how much she loves us, which too is never ending. I think it is important for us to remember that even if our abilities change, our love for each other still exists. For the person with dementia, Parkinson’s, or any other illness, it means you can still be part of many of the groups you were in before, even if you can no longer participate in the activity. For those of us who are their friends and loved ones, it means we can always remember to welcome them at whatever stage they are at. And lastly, don’t forget to document, through pictures and/or journaling, the memories of the time you have together. At times those “hard copies” of the memories may be very comforting to us all.